I have looked forward to Annual Conference each and every summer since I became a member of the Church of the Brethren in the 1970s. There are many reasons why I love Annual Conference. It’s the place I see friends I only see once a year. It’s a place where we gather as a community to reflect on what it means to be Brethren and where we fellowship together, including with Brethren from around the world. And worship at Annual Conference is where we celebrate God’s majesty and holiness. Last summer I got goose bumps every time we sang, “Light of the World, into our darkness come.” We sang this at the opening of each worship time while candles were carried around the worship hall through the darkness. It was a wonderful reminder to be open to God’s leading. This year’s theme, “Risk Hope”, is especially timely. Moderator Carol Scheppard’s monthly Bible studies have reminded us, “As we face the various storms of our times we gain strength and hope from the stories of God’s people in exile in Babylon.” When it is most difficult to find hope is the exact time that we must risk hope. This theme invites us to become a people who embody hope. I am so grateful each summer when we can come together in person with our sisters and brothers to worship, sing, conduct business and fellowship together. Annual Conference also provides webcasting for persons who cannot be present so that, even from far away, Brethren can join in times of business and worship. 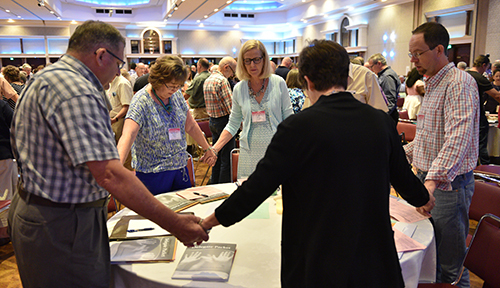 At its best, Annual Conference reminds us of who God is calling us to be as the body of Christ in the world. In the words of our mission statement: “Annual Conference exists to unite, strengthen, and equip the Church of the Brethren to follow Jesus.” In Grand Rapids this summer, may we take hold of the opportunities to unite, strengthen, and equip ourselves to follow Jesus! Learn more or register for this year’s Annual Conference at www.brethren.org/ac . 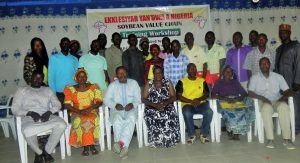 EYN Church of the Brethren in Nigeria’s Agricultural Department embarked on a Soya Beans Chain Training Workshop. The three day workshop was planned to train 32 people from different communities, reported Rev. James T. Mamza, Director of Integrated Community Based Development Program (ICBDP) The workshop trained trainers who will go back to their farming communities to stepdown the knowledge to others. Although the workshop was designed for 32 people only 18 were able to attend; about 50% of the participants were women. 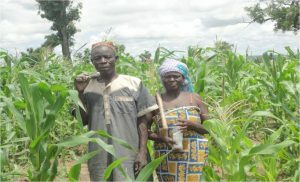 Three Facilitators: Mr. Kefas John, Mr. Daniel Y. Zafi and Mrs. Salamatu J. S. Billi were engaged to teach on soya beans as a crop, Soya beans production, use of inoculant in legumes, field measurement, and marketing soya beans. Other topics discussed include the use of agrochemicals and their side effects. 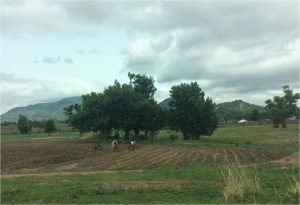 Such teaching is coming to the farming communities who now embracing the use of agrochemicals to reduce farming cost. One of the workshop participants from Chibok, Sister Gladys Mallum, commented that the training was an interesting one. Her concern is people’s acceptance to grab what she called “privilege to maximize farm produce and profit”. By embracing soya beans, she learned that people can fight poverty in their communities. This is the first of a series of workshops sponsored by CoB and EYN; they will continue in other zones. “The hand of the LORD came upon me, and… set me down in the middle of a valley; it was full of bones…. [God] said to me, ‘Mortal, can these bones live?’ I answered, ‘O Lord GOD, you know.’ Then [God] said to me, ‘Prophesy to these bones, and say to them: O dry bones, hear the word of the LORD.… I will cause breath to enter you, and you shall live’” (Ezekiel 37:1-5). Nothing reveals death and destruction more clearly than a large heap of bones. For Ezekiel, this vision represented the destruction of his beloved people—the destruction of God’s chosen nation. Ezekiel must have been horrified and full of despair as he surveyed this valley of death. Though our circumstances may not be as dire as Ezekiel’s vision, they can sometimes feel very similar. Even without intentionally searching, it’s easy to find decay in our world—in the brutal destruction of human life, in the ever-widening chasm of animosity between opposing groups, and, in general, in the diminishing focus to care for all people. If God asked us if broken forms could be restored, our words might mimic those of Ezekiel—whether of despair (“O Lord, [only] you know [if it’s possible]”) or even disgust (“O Lord, [surely] you know [it isn’t possible]”). What reason could we have to respond differently? Thankfully, the God who asks the question is also the God who answers it. In Ezekiel’s vision, God instructed him to prophesy to the bones, and in response, God breathed new life into them and regenerated those broken bodies. This was a promise of restoration for Israel, but was it just a vision or a metaphor? Surely such things don’t happen in real life. As we approach Easter, we remember that God does more than tell wonderful stories. We remember Jesus, the Savior, who became a lifeless bag of bones but did not stay that way. Though the conditions of nature declare that dry bones cannot be re-animated, the Creator and Redeemer of all life is not bound by these principles. What was only a shadow of hope in the vision of Ezekiel is fully realized in the resurrection of Jesus. And what God has done once, God can surely do again. 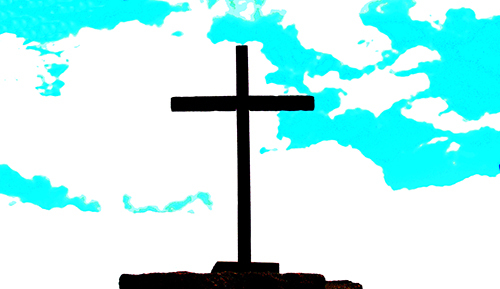 The resurrection power of God still works today. The new life of Jesus is the new life that we experience in following him. The resurrected body of Jesus is represented each year in the new life of plants and flowers. Though we may not see renewal in all areas and realms of life, God invites us to speak to any pile of bones, declaring God’s promise for restoration. May we have the courage to accept God’s promise for restoration and declare it to a world full of death and decay. May God once again breathe new life into dry bones. Learn more about the work of the Church of the Brethren at www.brethren.org or make an Easter gift to the ministries that you love at www.brethren.org/give .